Chronic kidney disease (CKD) is a decrease in kidney function for more than 3 months. 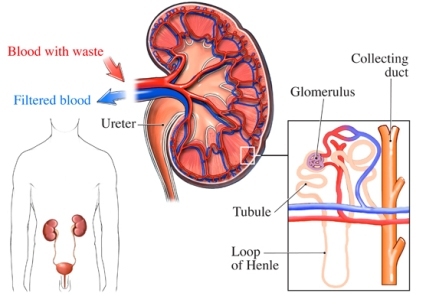 Kidneys clean waste from the blood. The waste then passes out of the body in urine. If they do not work well it can cause a number of symptoms. There are different levels of kidney disease. If more than 90% of the kidney is damaged and not working, it is considered kidney failure. The doctor will look at the results of blood and urine tests. The tests will show if kidneys are not working as expected. It can also show how severe the kidney failure is. You may be referred to a doctor who specializes in kidney disorders. Chronic renal disease cannot be cured. It is possible to slow further damage. Get a physical exam every year. It should include a urine test to check the health of your kidneys. If you smoke, talk to your doctor about options to help you quit. Drink water and other fluids to stay hydrated. Chronic kidney disease. Merck Manual Professional Version website. Available at: https://www.merckmanuals.com/professional/genitourinary-disorders/chronic-kidney-disease/chronic-kidney-disease. Updated March 2017. Accessed June 1, 2018. Chronic kidney disease (CKD) in adults. EBSCO DynaMed Plus website. Available at: http://www.dynamed.com/topics/dmp~AN~T115336/Chronic-kidney-disease-CKD-in-adults . Updated March 27, 2018. Accessed June 1, 2018. 8/26/2014 DynaMed Plus Systematic Literature Surveillance http://www.dynamed.com/topics/dmp~AN~T115336/Chronic-kidney-disease-CKD-in-adults : Heiwe S, Jacobson SH. Exercise training in adults with CKD: A systematic review and meta-analysis. Am J Kidney Dis. 2014;64(3):383-393. 4/6/2016 DynaMed Plus Systematic Literature Surveillance http://www.dynamed.com/topics/dmp~AN~T908689/Risk-factors-for-chronic-kidney-disease : Park H, Adeyemi A, et al. A meta-analytic assessment of the risk of chronic kidney disease in patients with chronic hepatitis C virus. J Viral Hepat. 2015;22(11):897-905.